"One of the most popular Christmas films of all time comes to the stage in this dazzling new production. Kris Kringle takes on the cynics among us in an all singing, all dancing adaptation of this Christmas favourite. 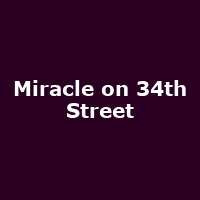 A white-bearded gentleman claiming to be the real Santa Claus brings about a genuine Miracle on 34th Street, spreading a wave of love throughout New York City. This heart-rending tale is one for all the family and promises to get you in the mood for the festive season."